Margaret Isabella "Peggy" White, daughter of William White and Louisa Annie Thomas, was born on 31 December 1916.1 She died aged 85 in Ontario, CanadaG, on 7 October 2002.2 She married ___ Wheatley. 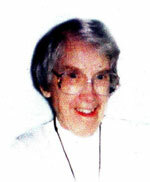 Email from Betty-Jeanne Grant to Chris Sackett, December 2012. Email from Betty-Jeanne Grant to Chris Sackett, April 2015.